Rundholz is known for their unconventional, daring, and whimsical designs, which nears a maximalism style. This edgy and experimental style is juxtaposed but seamlessly blended with the leisurely minimalistic design of Album di Famiglia. A Rundholz white linen top with drawstring side and open-back detail keeps a neutral color palette when paired with the Album di Famiglia greys. 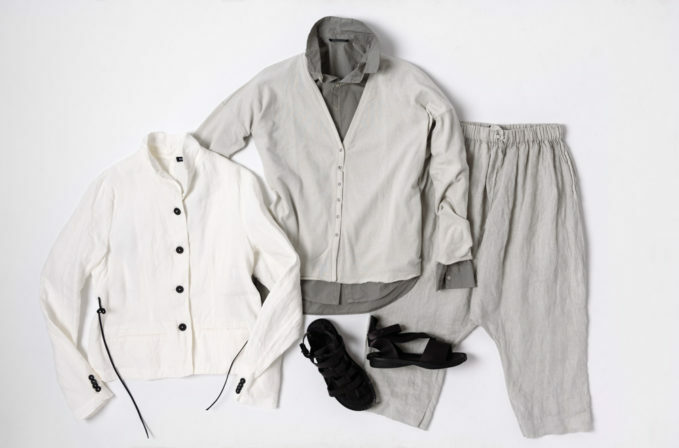 The Album di Famiglia grey linen drop crotch pants, cotton button-up shirt, and off-white cardigan are interchangeable for a relaxed style. This casual avant garde cotton and linen ensemble is finished with a pair of Trippen black leather sandals.